Christiana Ellis has a new book available today. It’s her very first book. Nina Kimberly, The Merciless is available today on Amazon.com. Ms. Ellis has released this free PDF. If you like it, head over to Amazon or your local book store and buy it. Authors Tee Morris and Philippa Ballantine have released their latest novels as free PDFs. Tee Morris is the author of the novels Morevi: The Chronicles of Raif and Askana and The Case of the Singing Sword: A Billibub Baddings Mystery. He is also the co-author of the non-fiction works Podcasting for Dummies and Expert Podcasting Practices for Dummies. He has podcasts for the above mention fiction as well as a companion podcast for the Dummies books. Philippa Ballantine is the author of the novels Weaver’s Web and Chasing the Bard. These novels are also available as podcasts. Her free PDF novel is Digital Magic, the follow up to Chasing the Bard. Tee’s free PDF novel is The Case of the Pitcher’s Pendant: A Billibub Baddings Mystery. If you couldn’t tell by the title this is the second in his Billi Baddings series. Both authors say that these books can be read and enjoyed without having read the earlier novels. We hope you enjoy them too. Please join Tee and Philippa as they make their run on the Amazon.com charts on Aug 8, 2008. If you enjoy Pitcher’s Pendant and Digital Magic, please support the authors by buying their books from Amazon.com on 8/8/08. They need your help to show the publishing world that podcast listeners matter. This is your chance to show the world what we can do. We did it before and we are doing it again. 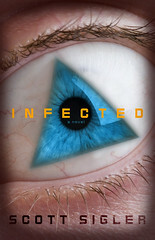 Scott Sigler’s new print version of Infected gets released on April 1st, 2008. Over the next few days, his publisher has allowed him to give away copies of the PDF version of the book for free. We are helping him do just that. By getting the file from that link, it’s proving to the big publishers that we podcasters have a clue about what we are doing. This file will only be active for a few days, at which time the link will become inactive and you’ll have to go to the bookstore to read the story. Which you should do anyway.